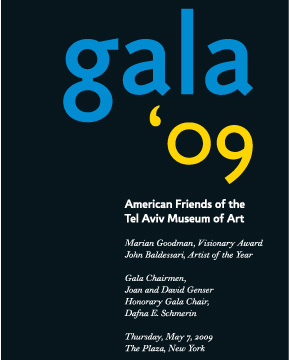 The American Friends of the Tel Aviv Museum of Art's Annual Gala will be held on May 7th, 2009 at the Plaza Hotel in New York City . Proceeds will benefit the Tel Aviv Museum of Art. Marian Goodman, one of the most influential and respected dealers of contemporary art in the U.S. and Europe will be receiving AFTAM’s Visionary Award. Since 1977, Marian Goodman has played an important role in introducing European artists to American audiences and helping to establish a vital dialogue among artists and institutions working internationally. Internationally acclaimed artist, John Baldessari whose art has been featured in more than 200 solo exhibitions in the U.S. and Europe and in over 750 group exhibitions will be “Artist of the Year.” His accomplishments include projects such as artist books, videos, films, billboards and public works and he has received numerous awards including the Americans for the Arts lifetime achievement award. There will be a silent and live auction featuring a print by John Baldessari and works by other prominent artists. The silent auction starts at 6:30 PM. The Gala attracts leaders in the international business and arts community. Ticket prices are $1000 per person. Ads in our Tribute Journal may also be purchased. Journal Ads range from $25,000 for a Platinum Full Page Ad (includes 10 tickets if desired) to $500 for a Quarter Page Ad.